My Life My Rules - What Are the Relationship Rules? Nobody likes rules, but they’re everywhere! We have rules for games, grammar, driving, you name it! In a world of “Do this! Don’t do that!” how can we know which rules really matter? 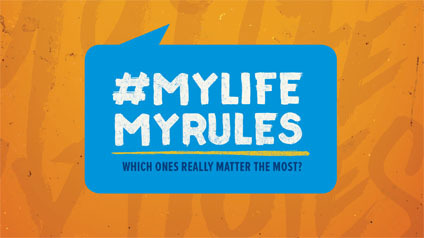 #mylifemyrules is a 6-week adventure that will help shed light on God’s purpose for us. Together, we’ll discover the positive difference it can bring into our lives today! My Life My Rules - Was Jesus Really the Ultimate Rule Breaker? My Life My Rules - Can I Make the Rules... Please?